“I cook everything, wash everything, do everything,” he said. Back in Damascus, Al-Ajam was just an electrician, now he is a veritable jack-of-all-trades. Sometimes children play with the discarded mussel shells at his feet, but Al-Ajam has mostly only the sea and his phone to keep him company. Al-Ajam unzips the hooded sweater he is wearing to protect his bald head from the scorching sun. 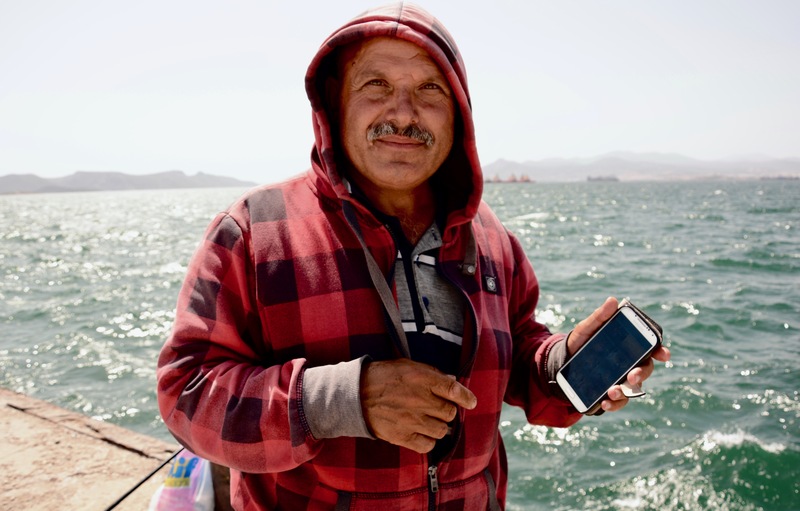 He pulls out the smartphone his son bought him before leaving to keep up with his family. Cupping his hand over the screen to shield it from the glare of the light, he scrolls through pictures of his grandson. He just turned one. Al-Ajam is a proud grandfather who likes showing off how cute he is. Although EU family reunification includes older people like Al-Ajam, it often focuses on minors and their parents. Grandparents find themselves waiting much longer to reunite with their families. Like any good fisherman, Al-Ajam has patience. But the waiting game has lasted over a year. He cannot fish forever.